Otis Taylor (born July 30, 1948, Chicago, Illinois, United States) is an American blues musician. He is a multi-instrumentalist whose talents include the guitar, banjo, mandolin, harmonica, and vocals. In 2001, he was awarded a fellowship to the Sundance Film Composers Laboratory. Taylor was born in Chicago and moved at a young age to Denver, Colorado, where he grew up. He originally grew up playing the banjo, but his father wanted him to be a jazz musician. Upon hearing that the banjo was originally an African instrument turned almost exclusively into a white bluegrass instrument in part through the derogatory black-face minstrel shows of the 19th century, Taylor dropped the banjo and began to focus solely on the guitar and harmonica. He played music professionally both in Europe and the United States in a variety of blues-oriented bands, including Zephyr, until 1977, when he left the music industry for other pursuits, including becoming an antique dealer. Taylor returned to music in 1995, and as of 2015, has released fourteen blues albums. His music tends to focus on the hard realities of life, especially relating to the black community. Some common themes in his music are murder, racism, poverty and the need for redemption. To date, Taylor has twelve Blues Music Awards nominations while White African was named 'Best Artist Debut'. Down Beat magazine critics' Poll named Taylor's Truth is Not Fiction as Blues CD of the Year for 2002. Living Blues readers' poll awarded Taylor (along with Etta James) the "Best Blues Entertainer" title in 2004. Down Beat named Taylor's Double V as Blues CD of the Year for 2005. Down Beat named Definition of a Circle as Blues CD of the Year for 2007. They also then named Recapturing the Banjo as "Blues CD of the Year, 2008." His 2008 effort, Recapturing the Banjo, was an attempt to reconnect himself and the world with the true African origins of the banjo. "There may not be," claimed Down Beat in a review, "a better roots album released this year or decade than Recapturing the Banjo." Taylor was the support act on Gary Moore's 2007/8/9 European tours and played on his last album. In May 2009, Taylor won a Blues Music Award for his banjo playing. He held the first Trance Blues Festival in Boulder, Colorado, in November 2010. His 2015 release Hey Joe Opus Red Meat was editor's choice for album of the year in Blues Music Magazine and Premier Guitar Magazine. Album of the year by Blues411 and #2 by Twangville. Named to top 30 albums of the year by The Blues magazine (UK). It received 4 and half stars from Down Beat and was named to their top 100 albums. The song "Nasty Letter" from Taylor's 2003 album, Truth Is Not Fiction, was featured on the soundtrack for the 2007 film Shooter. Michael Mann's 2009 film Public Enemies featured two of Taylor's songs, "Ten Million Slaves" and "Nasty Letter". The former was also featured in the film's trailer. Otis' songs were in "The Least Among You," a 2009 film with Louis Gossett, Jr., Lauren Holly, and William Devane. The song "Ten Million Slaves" was used as the closing song to the episode titled "Blowback" of the FX show, Justified. Crossing Jordan featured Otis' song "Rosa Rosa"
Songs in the science fiction series Surface. An Otis Taylor song was played on American Idol as part of the 2008 "Idol Gives Back" show. The song "Ten Million Slaves" was also played in the commercial for the 2011 season of Sons of Guns. "Nasty Letter" was used during the final episode of HBO series Luck. In 2008 the Santa Cruz Guitar Company released an Otis Taylor model acoustic guitar. Taylor married Carol Ellen Bjork in 1985. They have two daughters, Cassie Taylor and Jae Taylor. Taylor's eldest daughter, Cassie, is featured on many of his releases. She also plays several instruments including bass and vocals. Shooter - Music from the Motion Picture (2007) - "Nasty Letter"
^ "Otis Taylor". BBC. Retrieved 2014-10-23. ^ "2014 Blues Music Awards Nominees and Winners". Blues.about.com. Retrieved 2014-05-16. 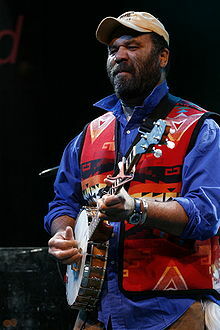 ^ "Otis Taylor: Recapturing The Banjo". HonestTune.com. Retrieved 2008-08-21. ^ "The Otis Taylor". Santa Cruz Guitar Company. Retrieved 2010-05-26. ^ "Otis Taylor : My World Is Gone Review". Guitarhoo!. Guitarhoo.com. 30 March 2013. Retrieved 31 December 2014. ^ "Music & Medias | Taylor, Otis: Hey Joe Opus Red Meat". in-akustik). 2015-02-13. Retrieved 2015-10-12. ^ "Cary Baker's conqueroo - Artist Otis Taylor". conqueroo). 2016-12-02. Retrieved 2017-02-05.